The bzeichnung of very sturdy workmanship and equipped with latest ideas of the company Kettler. 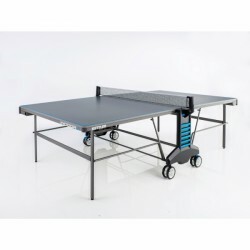 The Sponeta table tennis table competition S7-13 blue "Master Compact" for competitive sports is a professional, ITTF-approved indoor table tennis table with transport steering wheels of the Sponeta Pro line. The Kettler table tennis table Indoor 4 is a good starter table, which is equipped with latest detail solutions of Kettler. 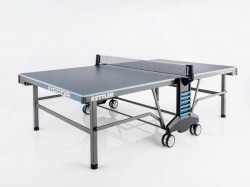 The Kettler Axos Indoor 1 table tennis table is a good starter model for leisure players. It is equipped with a 19 mm thick special wood board and a 25 mm round tube frame construction. Thanks to its 2 steerable and 2 fixed wheels, it is well to move and space-efficiently folded for storage. The simple operation and the good playing characteristics of this table are perfectly suitable for use in schools and for ambitious hobby players. 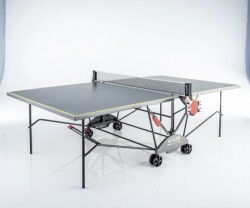 The Kettler Axos table tennis table Indoor 3 is characterized by its quick and comfortable assembly and disassembly. The ball holder included in delivery offers the practical possibility to store 2 bats and up to 6 balls directly on the table. The zeichnet sich besonders durch Ihren schnellen und komfortablen Auf- und Abbau aus. Die 19 mm special wood board is equipped with a special coating, which makes effective spins possible. 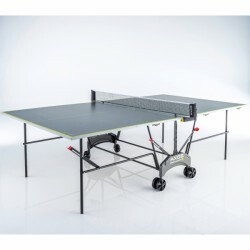 The Sponeta table tennis table competition S7-22 green "Standard Compact" is a professional ITTF norm corresponding indoor table tennis table (with feet) of the Sponeat Pro Line. 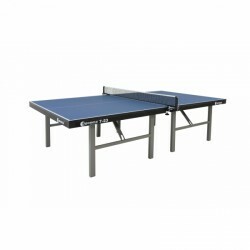 The Joola 300-S is a sturdy table tennis table, suitable for leisure players. 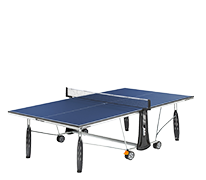 The Sponeta competition table tennis table S7-62/S7-63 is a high-quality table tennis table, which is designed for professional competitions - national as well as international - due to its sturdy construction. The table tennis table is equipped with a 25 mm thick fine-chipboard, which provides a good bouncing ability thanks to the multiple coating. I knew the table would need assembly, this proved to be relatively straight forward, and once completed I was impressed with the folding action and the ease in which you could put the table away in its upright position. When upright it is easy to manouvre and put away, and then to get back in to playing mode it is only a minute or two and you are back in business. I bought this product so that family and friends can pop around and we can play socially whenever we feel like it. The simplictiy of storage and qualilty of the product ensures it is not a chore to get ready or pack away, and everyone now asks when the next opportunity to come around and play will be! We recently bought 4 x Sponeta S7-22 tables. 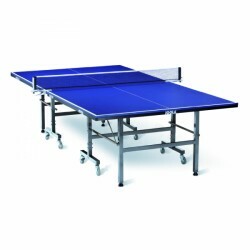 The Sponeta S7-22 is the best table tennis table for a secondary school environment. It is a very strong table with few parts to break. Once set up, the tables provide an excellent learning resource for students of all ages and ability. We will definitely be buying more of these tables in the future. This table is ITTF approved and extremely well built. The metal subframe is among the heaviest available. I don't think for the price you can buy another ITTF approved table at anywhere near this quality, it is built to last! It comes with a net as well, which is a bonus. The blue colour is a different shade from that used in the Stiga/Butterfly tables, but works well. Excellent quality match play table, this is the 2nd one of many we a re looking to purchase for our club. 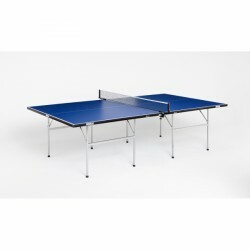 Excellent quality table tennis table suitable for match play at all levels. Assembly was a little long winded, but the results are a high quality compact storing table - we will be looking to add a further 5 to our clubs collection. Very happy with this table.Well made with an excellent playing surface and easily stored and assembled. I would recommend this table. Exercise at home with an indoor table tennis board. Table tennis has already been very popular worldwide for more than 100 years. It is independent of age or fitness level: playing on an indoor table tennis board trains fitness, coordination, and reaction - and it makes a lot of fun. You do not have to become a club member for occasional table tennis matches or workout sessions. Exercise and play comfortably at home with an indoor table tennis board. Compared to other ball sports, an indoor table tennis table demands low space in a fitness room or in the cellar. As most indoor table tennis boards are of official tournament dimensions, you even exercise under authentic conditions - at home ! 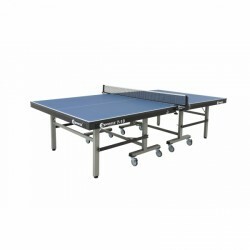 I wish to purchase an indoor table tennis board - what do I have to consider ? At first, the thickness of the board is decisive. The thickness of a table tennis table with chipboard, i.e. offered by Kettler or Cornilleau, is between 16 and 25 mm. Good playing features are achieved with an indoor table tennis board with a thickness of 19 to 22 mm. When you wish to store your indoor table tennis board on a small space after the match, you should mind a folding mechanism. Besides the space-saving storage, these table tennis tables offer the possibility of exercising alone. The frame is very important for sturdiness of the board, especially thickness and quality of tubes. We have introduced the Sport-Tiedje evaluation for orientation when purchasing an indoor table tennis board. Each table tennis table is evaluated in the categories "play", "mobility", "operability", and "stability". In addition, evaluations of other customers are of great help for finding a decision. 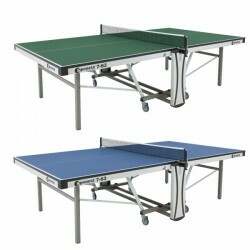 Are there any differences between indoor table tennis boards and indoor table tennis tables ?